Seen near Amsterdam Zuid station. This one looks to have a hub gear mounted along the bottom just under the pilot's handlebars. Wooden bikes outside a hotel. An aerodynamic bakfiets variant? Redefinition of a shopper? Some form of fully faired recumbent trike (outside one of the offices I work in). Previously mentioned odd mixture. Does anyone have any idea who made the frame? 1) As I cycled along The Highway this morning I passed a woman in business attire on a DorisBike. I saw a number of other DorisBikes being pedalled along the pavement but this woman was happily pootling along the road as the rest of traffic zoomed around her. 2) Heading in the other direction on The Highway was someone on a recumbent trike. This in itself is a rare sight in London. 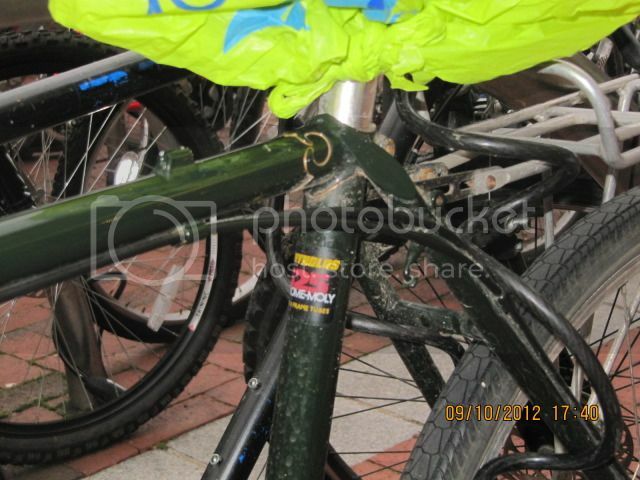 The odd thing was the fairing which extended up over the top of the rider to the back of the trike, providing a roof! The fairing wasn't of the nose cone variety, and the whole setup looked 'home made', but from the brief view I had I'd say it was well done. I'd be tempted to attribute that to Swallow cycles, the coincidence looks too likely, but there's something deeply dodgy about it. Deeply dodgy IMO that such a nice looking frame, with such an expensive hub & nice honey-coloured Brooks saddle, should have been messed around so crudely. Leading link suspension and stuff. The bare metal parts don't look like they'd survive a winter though. Found this when I came down to the bike room after work today. No visible brakes, no visible indication of more than one gear. The basket has been added, but the rack appears to have come with the bike. The chain case is vinyl (or similar). Click the pic to access a larger version. There's a reaction arm for a (presumably) back-pedal brake on the chainstay. Well spotted. Still intrigued by this bike - will do some more digging as displacement activity later today. Bike still there this morning, but in a different spot (one that I usually use ). Couldn't tell if it had been ridden or the owner just moved it. Still not-road-legal though. What braking opportunities are there if the chain snaps? With full mudguards, the push-shoe-onto-tyre option is not available. That's fairly typical of European utility bikes. A single back pedal brake is common. 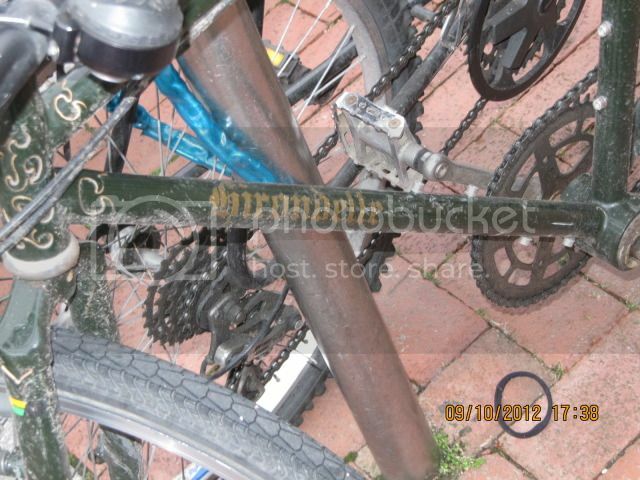 To be honest, how often does a single speed chain fail on a bike that isn't ridden hard? These things are designed for gentle pootling about. And if the brakes did fail, the chances are that the speed will be so slow and the saddle so low that the rider will be able to brake effectively by putting their feet down. Incidentally, that's a very clean and tidy looking bike storage facility. It looks like a modern take on those classic British heavy-duty bikes of yore, the type that still abound in India and doubtless other ex-colonies under names such as Hercules and Atlas. The lugless construction, seatstays that are not bolted on to the frame, and unicrown fork, all obviously make it much more recent and the size of the downtube indicates an aluminium frame - so it's curious that it has the double top tube, which must add weight and isn't really necessary with modern materials. Very odd. Or is it really made out of tin plate? I'd guess it doesn't originate in the UK - maybe from Holland or Scandinavia? Intriguing. Not in the UK. But the light mounted on the left side of the fork shows that it wasn't designed for the UK. Saw a Klein Palomino http://www.mtbr.com/cat/bikes/xc-suspensio/klein/palomino-xv/prd_363093_1526crx.aspxfitted with a child seat and being used for the school run today. One of my dream bikes back in the day. Denmark and several other countries like Australia only require 1 functioning brake. 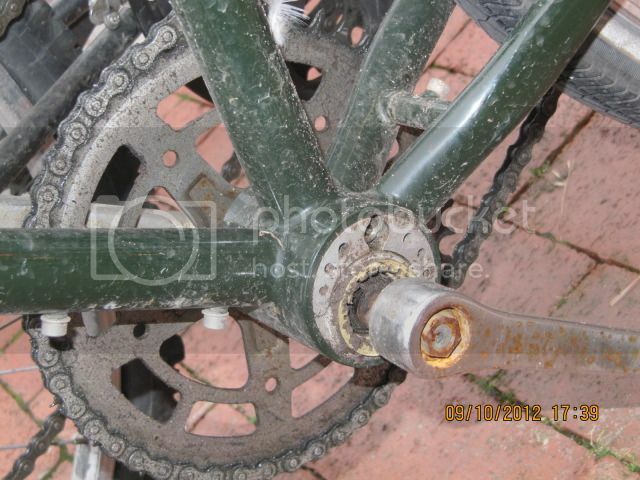 Single speed chains are a very reliable actuation mechanism. Incorrect, you need two independent brakes in Denmark too. rules where changed around 10 years ago. 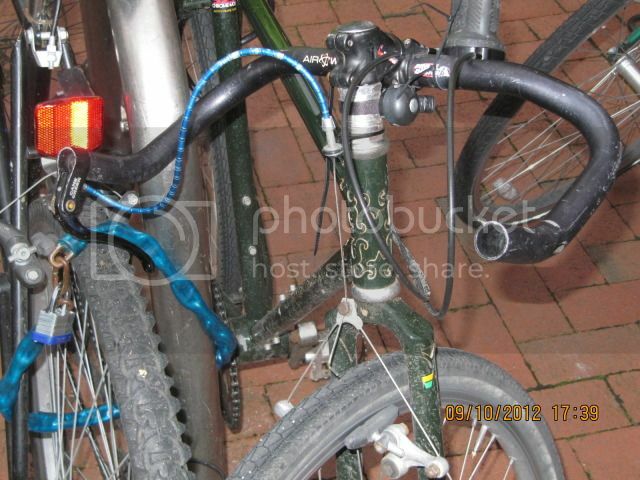 But if you have a bike/frame from before that date one brake is enough. My 1937 Raleigh tandem originally had a light bracket for the left fork leg. Opinion varies as to it being intended for the continent, or that it was more important for the feeble light to pick up the edge of the road. Met the owner this evening. 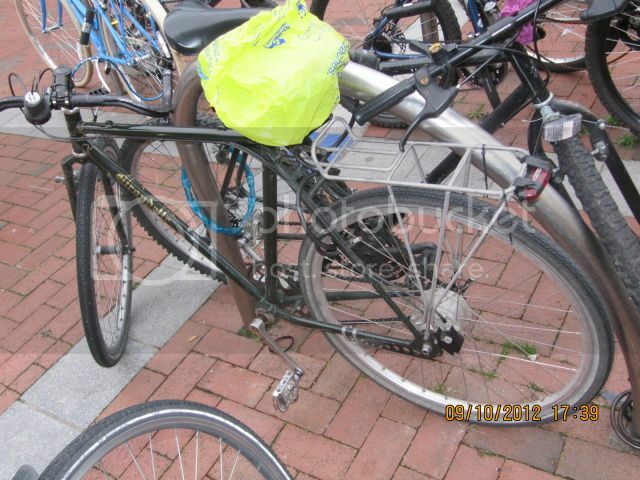 The bike is from the Netherlands and is, as he so eloquently put it "the crappiest Dutch bike you can get". He admits it's heavy and cumbersome, but it does what he needs it to do. I wonder what prompted the change. So when I cycled around Copenhagen in the 1980s on a borrowed bike with only a back-pedal brake, it was legal, then? A pity. I hated it. Yes and if had the bike today and rode it, it will still be legal because the bike predates the law. I must bring my camera more and take pictures of all the weird bikes around here. I quite enjoyed riding PBP03 with a coaster braked bike. YMMV of course and obviously did. A Surly Moonlander fitted with a NuVinci N360 CVT hub - even by fatbike standards, this is definitely different! Interestingly, the N360 costs less than an Alfine-11, but it's still a tad on the heavy side for my particular purposes. 1 - I do have them, and thanks to the wonders of the Interwebs I'm back in touch with this particular person after over 10 years.